Confirming a previous rumor, AT&T just announced a rebranding of its GoPhone service, which, from now on, will be known as AT&T Prepaid. In celebration of the new name, AT&T is offering two months of free wireless service to new prepaid customers. To benefit from the offer - available from July 14 through September 21 - you have to activate and keep a new line for at least 1 year, and you'll get account credit for the third and twelfth months of service. You'll also have to choose between one of these two AT&T Prepaid plans: $60 per month (includes unlimited talk, text, and data), or $40 per month (includes unlimited talk and text, and 6GB of data). 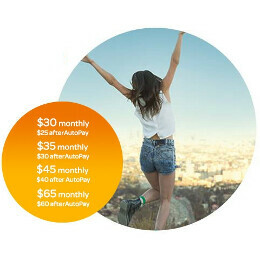 Like all prepaid services, AT&T Prepaid does not require a contract - you'll simply pay monthly as you go. In addition to the two plans that we already mentioned, AT&T also lets you choose a Prepaid plan for $30 per month, though this only includes 1 GB of data (plus unlimited talk & text). All prices listed above are valid only after you enroll in AT&T's AutoPay savings program - registration is free, and you simply need a credit/debit card, or e-Check to join. If you don't enroll in AutoPay, each plan will cost $5 more. Right now, the AT&T Prepaid lineup includes mostly low-end smartphones, though you can also get a few more advanced handsets like the Apple iPhone SE (for $244.99) or the iPhone 6 (for $344.99). More details can be found at AT&T via the source link below. I like the name change. It makes sense. Also, I think you should mention that you can BYOD. That's why I've always gone back to AT&T and their prepaid plans. Currently on the $40 plan and enrolled in Auto Pay using the iPhone SE that I purchased on Amazon refurbished. I may give this a try. Jumped from Verizon to Tmobile. Service just isnt up to par with the big companies where I live. This is a pretty good deal for $40. Do they throttle the data vs the standard plans? That was always a hangup with Cricket, which is essentially rebranded Go Phone as well. We have AT&T now, and this would save us money, and give us more data. But if they choke it off compared to the standard service, I'd be hesitant to change. I've had GoPhone in the past and I was getting over 20Mbps in speed. Currently using it. No, they don't throttle your data. Yeah, I just saw that. Not worth it at all, to me.